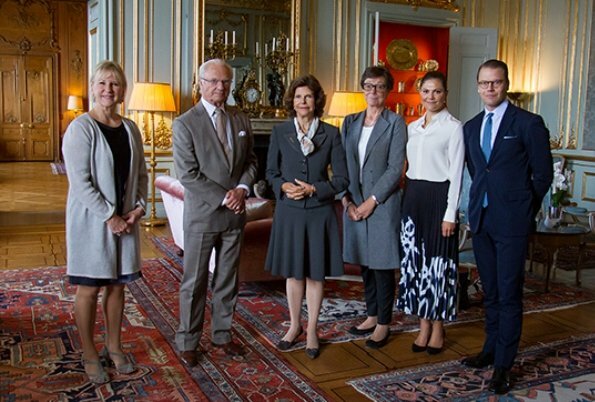 King Carl Gustaf, Queen Silvia, Crown Princess Victoria and Prince Daniel received Swedish Foreign Affairs Minister Margot Wallström at Stockholm Royal Palace and attended an information meeting about planning of state visits to be made soon, meetings planned beforehand, current status and relations with these countries. Love the suit of Queen Silvia and the colour. Also not a pencil skirt. Not sure about Victoria's skirt. It looks, if she wrapped a cardigan around her waist. But all in all they Look good.